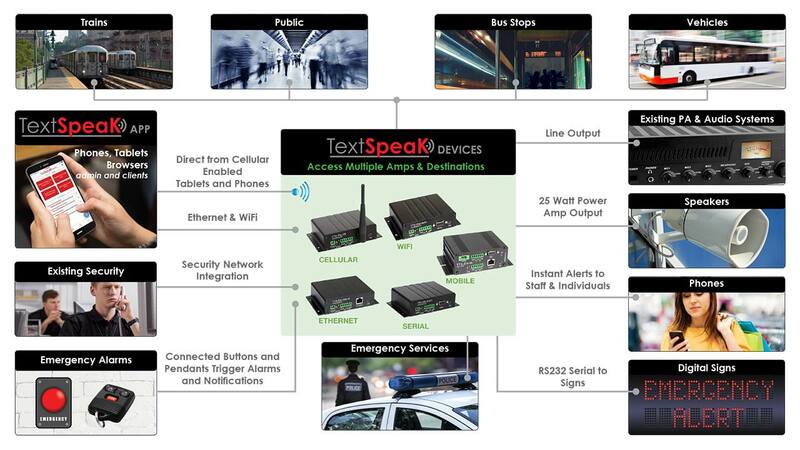 TextSpeak has been supplying human sounding embedded text to speech (TTS) ADA compliant voice solutions to transit customers for over 25 years. Recent deployments for transit systems in New York, Indianapolis (IndyGo), Paris, Los Angeles and other cities solve disability compliance mandates, and improve the passenger experience. TextSpeak NOTIFY! is a new real time Emergency Mass Notification system for transit hubs and stations that expands the capabilities of our existing technologies to safeguard staff and passengers. TextSpeak NOTIFY! offers administrators, security teams and local first responders a means to broadcast instant emergency communication to passengers, staff and the general public in seconds, from anywhere. TextSpeak NOTIFY! systems are easy to deploy, manage and afford. Simple to use by staff & associates. 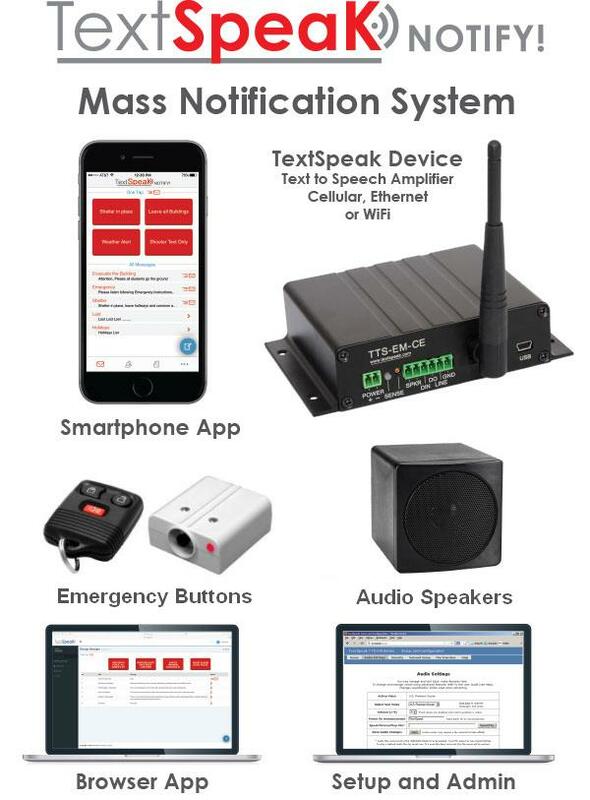 The all-in-one package includes TextSpeak’s award winning voice announcement system, intuitive mobile apps, alert pendants and can be configured using Cellular, WiFi, & Ethernet. 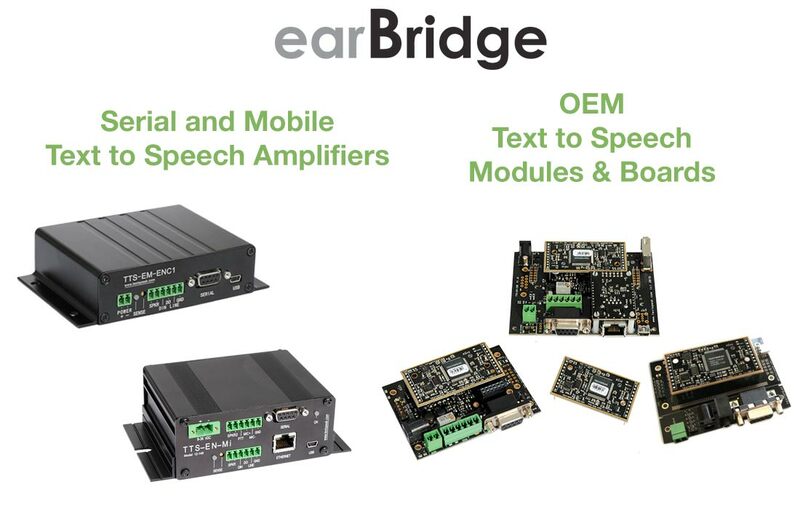 The system also ties to TextSpeak’s industry standard earBridge Text to Speech amplifiers, currently in use in Paris, New York and L.A. transit systems. The system offers transit administrators, fire, police and officials access to send real-time alerts as audio announcements, digital displays, email alerts and text messaging from command centers, mobile phones, sensors and wearable emergency pendants. Start with a TextSpeak NOTIFY! Basic system, including the TextSpeak NOTIFY! app, text to speech amplifier, emergency pendant and speaker. Setup and test with general announcements to determine how best to deploy the system in your application. Learn more. It is easy to purchase addition users, amps, pendants, speakers and other options to build a much larger system including connectivity into existing systems. TextSpeak NOTIFY! is fully scaleable from a single location to Enterprise level multi-location applications. Learn more. Installation is fully scalable with to allow multiple transit centers to be managed and interconnected. Announcements and alerts can be issued to individuals, stations or the entire transit system at any time. Trigger EVENTS from wired contacts. Check out TextSpeak NOTIFY! 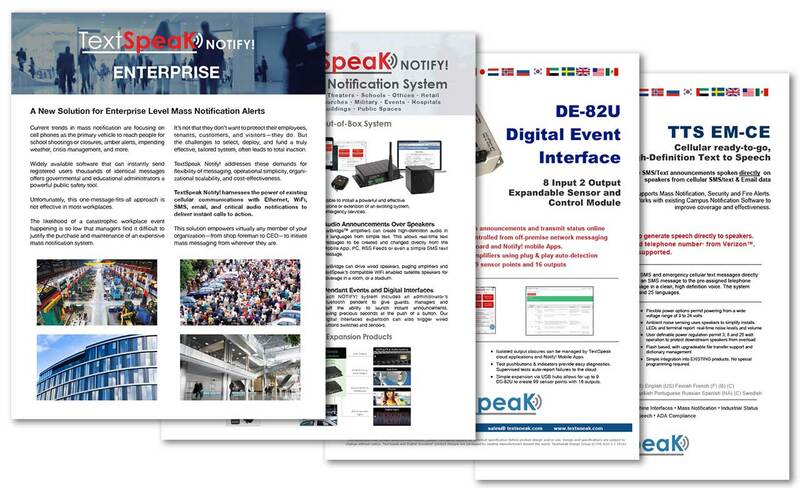 Solution and Product sheets and listen to text to speech samples. 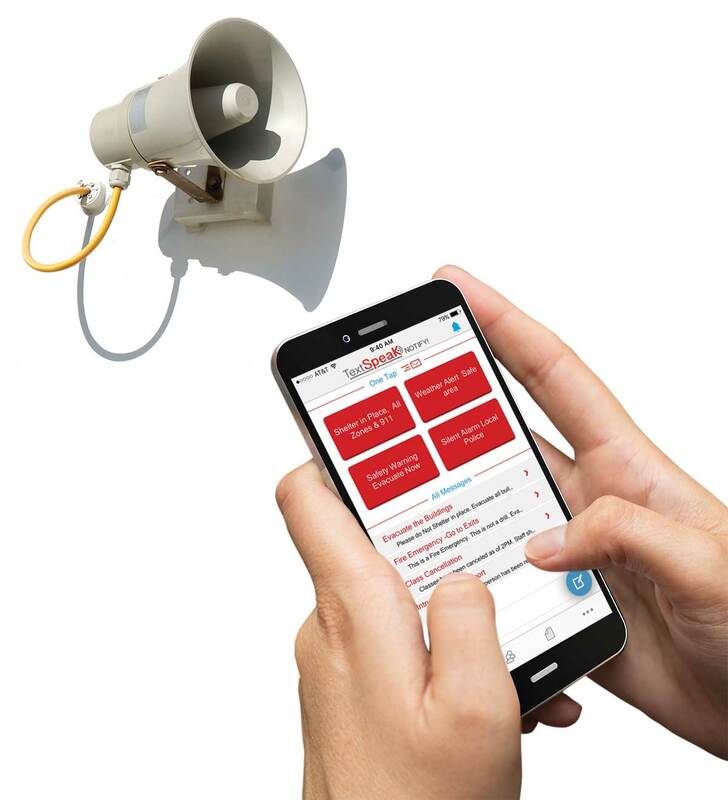 Everything needed to integrate Mass Notification into your facility. See how best to integrate Textspeak NOTIFY! into stations, bus stops, staff locations for general and emergency notifications. providing audio coverage. 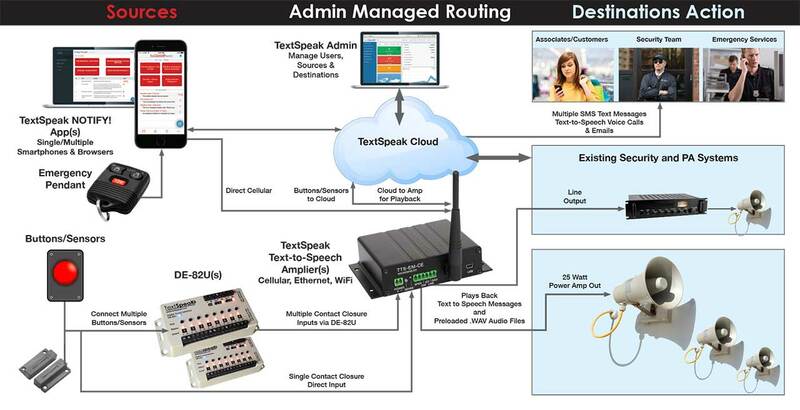 Add extended audio paging anywhere over large complexes using existing SMS and text alerting software.